Design Your Own LockStart Designing! 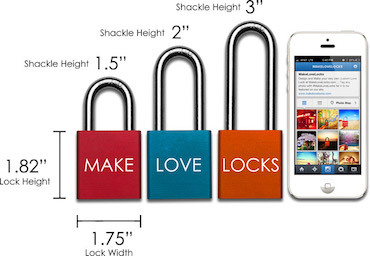 Laser Engraved Anodized Aluminum Love Locks , Your Design is permanently Laser Engraved into the padlock! Our engraving process produces a smooth crisp engraving. All Love Locks include 2 keys. Quality aluminum locks that come in eight beautiful metallic colors with permenent laser engravings. Add any text, pictures, clipart, and symbols to truly make your design unique — no two locks are the same! Each lock is individually laser engraved, We strive to process all orders within 1 business day and ship immediately following. FedEx Shipments are NOT Delivered on WEEKENDS. If Saturday delivery is required , please contact us so we can faciliate this. USPS First Class shipments will be mailed inside a padded envelope, due to weight restrictions we can not offer a decorative gift box with these shipments. Priority and Express packages are shipped inside a free pillow gift box and topped off with a silver bow. There is no additional charge for this. ©2019 Make Interactive LLC -- All artwork within this web site is protected under U.S. copyright laws and international conventions and is the sole property of MakeLoveLocks.com. No portion of any artwork or statements may be used, downloaded, reproduced using any means, copied, linked to, or transferred electronically, without prior written permission from MakeLoveLocks.com .